White meat turkey is on my approved meat list, but white meat turkey can be drier than paper to eat, as I found out when I was in the hospital last August and ate what passed for a meal of turkey there. Turkey burgers present the opportunity to use ketchup to flavor them up a bit. But my nutrition nazi had a warning about buying ground turkey or pre-made turkey burgers. Pre-made turkey burgers, such as the ones in restaurants or sold pre-made in supermarkets, contain turkey skin to give them some moisture so their fat content can be as high as that of some red meats. Not all ground turkey is the same. There’s lean and there’s extra lean. 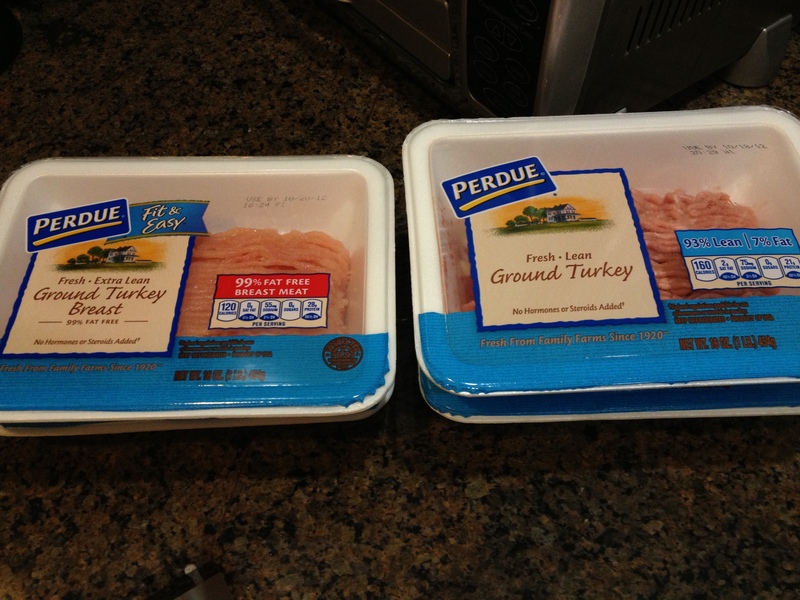 I’ve found a corollary to that warning in my shopping, namely that not all ground turkey is the same leanness either. Stores sell lean ground turkey and extra lean ground turkey. The lean ground turkey, which often goes on sale for $3.99 a pound, has 8 grams of fat per serving (depending on the brand) while the extra lean, which never seems to go on sale in my area and costs $5.69 or more a pound, has only 1 gram of fat per serving. Rather than settle for the 8 grams (and I eat more than one serving of ground turkey at a sitting), I buy a one pound package of each type and mix them together to make a turkey meatloaf, hopefully getting a total mixture with about 4.5 grams of fat per serving.